Place the grated zucchini and potato in a colander in a bowl, sprinkle over a pinch of salt and mix through. Set aside for 10 minutes to bring out the excess moisture. Strain and squeeze the water out and transfer to a large mixing bowl. Add the corn, fetta, spring onions and mix to combine. Sift the flour and baking powder into the mixing bowl, season to taste with salt and pepper and stir through until evenly combined. Pour in the egg and mix through to incorporate. Heat EVOO in a 25cm, deep frypan over a medium heat and spread the oil to cover the base and up the sides to avoid sticking. Pour in the batter and spread it out to cover the base of the pan. Smooth over the surface, cover with a lid or foil and reduce the heat. Cook for 10 minutes, until almost set and lightly golden on the base. Turn the grill to medium-high. Uncover the frittata and transfer to the grill for a final 10-12 minutes until the centre is firm and the top is golden and crispy in parts. Remove and slide it out onto a rack to cool slightly. Lightly dress the rocket with a little olive oil, salt and pepper, and lemon juice. 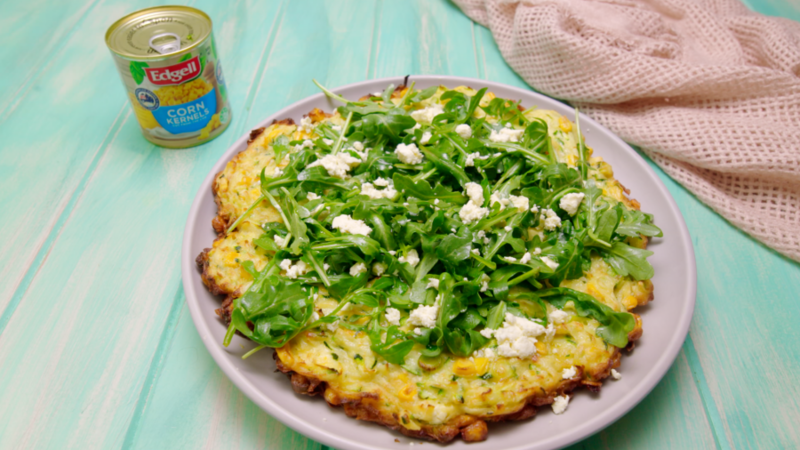 Serve the frittata topped with the dressed leaves and a crumbling of feta.